In the chaos of smart phone wars, the tech savvy often forget about the many people who only need a phone to make voice calls. Even the latest generation of common feature phones include cameras, web browsers, and plenty of extra goods. Fortunately, the folks at Just5 have a unique solution: a simple phone. 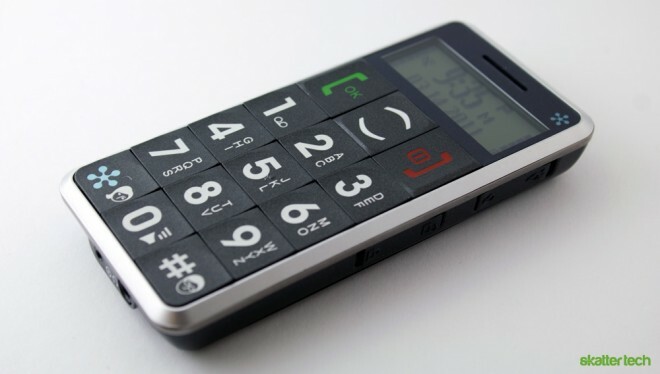 Intended for senior citizens, this phone aims to offer freedom from complication. When I say simple, I really mean it. This phone does not even have a color screen. It fees like a resurrected late 90s cell phone with a monochrome display and orange back lighting. For those who hate pecking at a touch screen or are visually impaired, the large numeric keypad which covers over two-thirds of the front side is a blessing. Even the on-screen fonts are large and bold for easy reading even under direct sunlight. The main screen shows off signal strength, battery life, and the date/time. There is not much this phone has aside from a phone book, call history, alarm clock, and calculator. It surprisingly supports SMS, but I highly doubt anyone would use it. The Just5 is compatible with hearing aids and it amplifies audio for those with poor hearing. Unlike smart phones that need recharging daily, this phone lasts for 6 days on standby and offers about two hours of talk time. Despite the self-proclaimed “simple features” name tag, it oddly has a flash light with a dedicated switch on the right side. In addition, the Just5 sports a FM radio with a physical switch on the left side. Like most phones that have a vulnerable keypad, a lock switch prevents accidental entry. 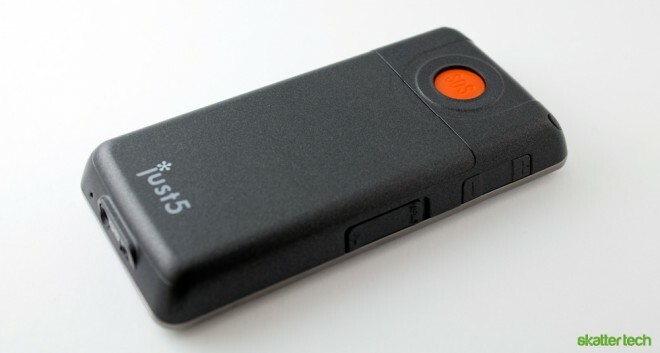 One feature that stands out is the large recessed red SOS button on the back side. Once programmed properly, a 4-second-long press will initiate an automated sequence. It starts with a loud siren to draw attention towards you. Next, the phone automatically sends “help me” text messages to five emergency contacts. It does not end there, the phone then begins dialing each of those five numbers one by one with speaker phone enabled until someone answers. The audible alert feature is a great addition if an elderly person is trying to draw attention when having a medical emergency in a public place, however it might be a dangerous feature to have during situations when placing a discrete call is vital. It will hopefully do more good than harm. I did not walk in expecting too much when I began to test phone calls, but I found surprising results. The caller on the other end could actually hear me better on this phone over a few brand new smart phones I had at home. I felt as though I could hear the person on the other end clearer and louder too. Just5 bundles a wired headset in the box and the phone is compatible with any standard 3.55 mm headphone jack. The phone notably lacks Bluetooth keeping true to the simplicity, so wireless headsets are unfortunately out of the question. One quirk, the keypad makes extremely loud noises even after lowering the volume. I ended up switching the phone to silent mode since the obnoxious sounds gave me a quick headache. Just when I started to get excited for a phone that sticks to basic features, I realized that the suggested retail price is a whopping $90. Although retailers such as Amazon sell it for a bit cheaper, it is a lot to pay for something that does not do much. Major carriers including AT&T and Verizon Wireless offer decent pre-paid phones without contracts for a fraction of the cost. Monthly plans begin at $10 for 100 minutes and 50 text messages. There are $20 and $30 monthly plans for 200 and 300 minutes of talk time and the same number of texts, respectively. Heavy users can opt for an unlimited talk and text plan which costs $40 per month. When it comes down to it, the Just5 is truly for senior citizens. I can say for sure that the elderly who generally want to avoid technology all together may actually consider using one of these. The large buttons, loud sounds, and emergency features are helpful for just that. I should note that competitors such as Snapfon also have similar offerings. Jitterbug also comes to mind. Just5 also lists children as a potential customer, although I doubt that anyone in middle school would be caught dead with one of these in a generation of iPods and other fancy gadgets. For the most part, Just5 avoids the whole issue of phones with small keys, hard to read text, and a boatload of unnecessary complications. The phone does cost more than many prepaid alternatives, so I would suggest looking into this device only if bad eyesight or hearing is also a factor. I also suggest the use of the Just5 Easyphone to the elderly. This is basically a simple phone and PERS at the same time. This very helpful in times of emergency as its emergency SOS button at the back of the phone only needs to be pressed once. With that, the phone will automatically activate its automatic dialing, automatic alarm, and automatic loudspeaker. The phone also presents other practical features and is very affordable, too. So I view this is a perfect device for elderly. There is already such phone for Senior Citizens by iball Mobiles and has been in circulation since long. Dont know whether iball guys copiet Just5 or the other way round. But if you want all those features and eye candy then iball is surely your first and last choice. I agree with Mara. Tracfone’s senior value phone is inexpensive and simple. This Just 5 is too expensive and its simplicity might be good for seniors with dementia or severely limited vision but for most, th simple Tracfone is prefereable. While I wish providers like SVC or Jitterbug offered a phone like this one, I still think the price of Just5, like Jitterbug, is too high for the occassional senior cell phone user. The same type of senior focused technology is avaiable from SVC(Tracfone prepaid) for less than $20 and that seems like a far better and more fitting price potentially for a senior who may or may not use the phone often enough to be worth the price. SVC (my grandma’s company) phone is nothing like this one and I wish that company had the look of Just5 and the price of SVC. Hi guys! I’ve checked out the offers of Tracfone before I decided to get my mom a Just5 cell phone so I know that Just5 makes a smarter choice for practical phone users. First of all, the cheapest minute plan that this provider offers only costs $10. This plan has 100 minutes already. So that’s practically $.10 per minute. Tracfone on the other hand charges $20 for 60 minutes. That’s $.33 per minute. As well, Just5 only charges $40 for their 30 days unlimited service. Tracfone charges $45 for the same service. So tell me, which has higher charges between these two providers? Haha I remember when you showed me this, so funny. Esp the dude trying to make it sound all hip. Although for my grandpa, I think this fone will do wonders. Ethel, what would you say the advantages of paying the additional cost for Just5 would be? I’m deciding between an SVC phone and Just5 for my grandparents. All they need is the emergency service and the ability to call once and awhile. Is there any recommendations you may have? They obviously want the cheapest price, but I’d like to hear your side of the story. Otherwise, it seems like everyone else is only attesting to the lowest price of SVC phones and we may go that route. My grandmother uses the Tracfone’s Senior Value phone. I dont know much about them but this phone looked kinda neat. She told me the reason she chose the tracfone is because it is cheap. I think the SVC Tacfone deal is a steal. A phone for under $20 is unreal. It really isn’y only for seniors – it is just a great deal and all without a contract! my favorite service for senior cell phones is SVC from Tracfone. Advantages: no contract, use of Verizon and ATT networks, and available for under 10 dollars per month. I don’t think the modern senior needs THAT much help using a phone and the cost of this phone seems unjustified. WOW!! This cell phone looks incredible for my grandma. I’m still thinking of getting my grandma an SVC. What are the pros and cons of getting the SVC vs this just5 phone? Is Just5 available in N,Z.? At what price? What use is a price which doesn”t say US AUS. or N.Z. U.S.$ is double in N.Z. sometimes. Find Just5 in Facebook and keep track of the updated information it delivers about safety and technology. http://www.facebook.com/Just5online.